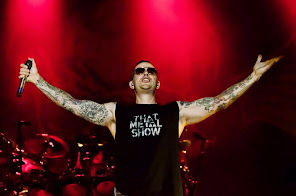 Avenged Sevenfold News: Avenged Sevenfold's M.Shadows: "I haven’t seen any classic games come out in a long time"
Avenged Sevenfold's M.Shadows: "I haven’t seen any classic games come out in a long time"
I know you’re a big time gamer yourself. Can you talk a little about some of the things you’ve seen in video games over the years that inspired you and that you wanted to make sure came across in the game itself? I wanted to make sure a certain level of difficulty came across. I’m one of those people that have seen games get bigger and badder and color graphics but I haven’t seen any classic games come out in a long time. In terms of classic, I think of the old-school games that are very simple mechanics but they pose a lot of threat in their difficulty level. Games like ‘Contra,’ ‘Gauntlet’ and ‘Zelda,’ ‘Mario Brothers.’ All those games are classic and they’re pretty simple. We wanted to do something like that. Doing an old-school looking console game on mobile would be a cool way to do that. We figured a lot of people my age around their early thirties would appreciate a game like this. So hopefully some of the kids growing up will appreciate a game like this, as well.